Blue lighting, dry ice, buttons flashing on instrument panels, men built like tanks showering together, a token woman. Boiler suits, sleeveless t-shirts, flight jackets, and the odd backwards-facing baseball cap. Not one, but two Teutonic bad guys. 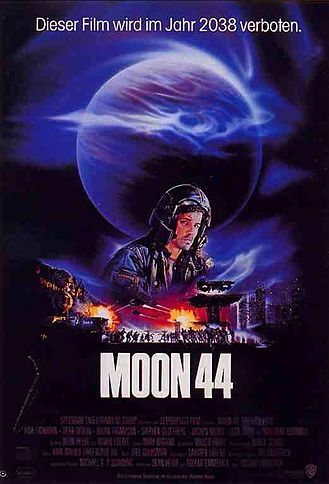 Blue-collar sci-fi at its best or worst, depending upon how well-disposed you are to blatant low-budget rip-offs of the Alien(s) and Blade Runner visual aesthetic and scripting-by-numbers. It even has bad robots. I like this film. The plot pitches military-industrial "Company" types against nerdy young men against a gang of muscular criminals training as helicopter pilots on a far-away dusky world. After an hour of petty conflict, a fleet of mischievous intergalactic raiders turn up to attack the eponymous moon. The three tribes must unite to fight the droid-driven spacecraft. Heroic sacrifices, ghosts in the machine, newly-discovered veins of suppressed nobility and pluck, and reversals of fortune by the bucketload are the stock in trade. The main butting-of-heads takes place between the square-faced leader of the criminals and an undercover cop who must feign a history of, and a tendency towards, delinquency. The convict makes the usual taunts about the cop's sexuality and his mother, but also teases him about a fondness for reading - the latter has stowed a small library of eighteenth- and nineteenth-century classics in his duffel bag. We know they're eventually going to lock arms against the bad guys as a shoulder-thumping homoerotically-charged tag-team. The first sign of comradeliness comes with the criminal's late-night raid of the cop's locker to find some bedtime reading. There's nothing like a Penguin Classic for adding a patina of civilization to walking cinder-block.